It is estimated that 20-30% of the population suffers from fallen arches or flat feet. A flat foot arch may lead to more severe lower extremities’ problems. Custom orthotics are specialized shoe insoles that foot care professionals utilize to treat foot conditions and abnormalities such as plantar fasciitis, foot pains, and flat feet. Therefore, if you have pain or problems associated with your flat feet, we recommend seeing a foot care specialist to correct the problem. The arch of your foot provides an elastic, springy connection between the heel and the front part of the foot. Flat feet, also known as “fallen arches” are the collapse of these longitudinal arches of your feet. This condition can be congenital or as the result of other conditions such as injury, illness, weak muscles, prolonged stress to the foot, pregnancy, faulty bio mechanics, and aging. Factors such as obesity and diabetes could be risk factors. When the arch of your foot collapses, it exerts pressure on different parts of your lower limbs. Consequently, you feel pain, discomfort, and reduction in the range of motion of your foot during your daily activities. There are two types of flat feet, rigid and flexible. In rigid flat feet, there is no arch at any time. Trauma, infection, autoimmune disorders, or genetic bone structure can result in rigid flat feet. If flat feet occur only in postures such as standing, they are called flexible flat feet and are most often due to a weakened ligament or muscle weakness. Custom orthotics are foot insoles that are tailored specifically to your feet . A foot specialist also known as a Chriopodist will perform a thorough examination of your feet. The Chiropodist then uses a 3d laser to accurately measure the form of your feet. The 3d lasers capture a three-dimensional image of each foot to make the orthotics as comfortable a fit as possible. The Custom Orthotics are then built the exact specifications you require. 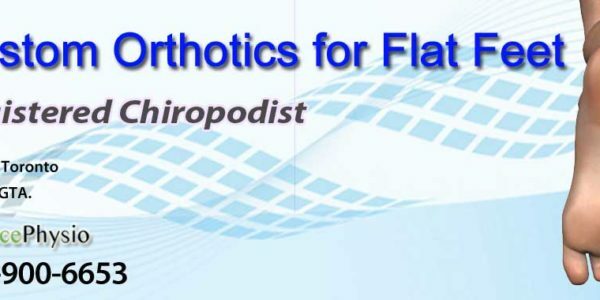 Custom orthotics are helpful in correcting your biomechanical faults and help to prevent damage to feet structures. 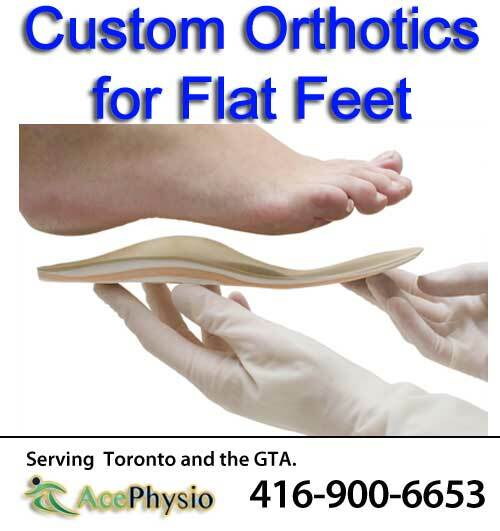 At Ace Physiotherapy downtown Toronto our foot care specialists are ready to help you with flat feet. Book an appointment with a Chiropodist today!